This year,I am enjoying the Dare to Get Dirty challenges in a different way, mainly because I'm doing it from the "other" side as current Dirty Dozen. It has been so much fun seeing everything happen behind the scenes. I have made this card for my challenge :-). Eeks!!! I'm super excited to be hosting my own challenge. 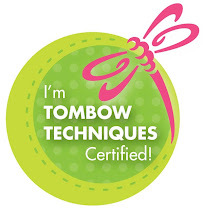 It's a fun challenge (although one of my sample makers may have cursed me a little LOL). Make sure you head on over to this thread to check out my challenge. For my card, I have used the MFT set called "Disco Queen" that I have had since shortly after it came out but sadly it hadn't seen ink yet. Sad I know.... The image was stamped in Versafine Onyx Black, embossed with clear embossing powder and then watercolored with Tombow Markers. The DP is a combination of Basic Grey and MME. The large photo of my card doesn't show the disco ball in as much detail as I wanted so here's a close up of the Diamond Stickles I put on it to add a little bling. Thanks for dropping by and make sure you head on over to SCS to check out all the DTGD details (if you're not a Fan Club member yet, you'll definitely want to be). Oooohhh- I LOVE how deep the colors get from using Tombows ! LOVE this! 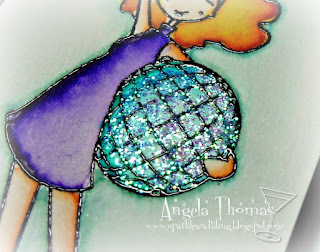 The black embossing is terrific and I love the sparkle on the disco ball. SO cute! Love that disco ball! It's awesome!!! Your card rocks! What a fabulous card! So fun!